Nuffic Neso "Happy with Quality of Fair"
Thousands of prospective Russian students attended the Begin Undergrad Education Fairs in Moscow and St Petersburg held over the weekend, where Wittenborg University of Applied Sciences was one many stand holders, receiving hundreds of inquiries from students who are considering the Netherlands as a study destination. 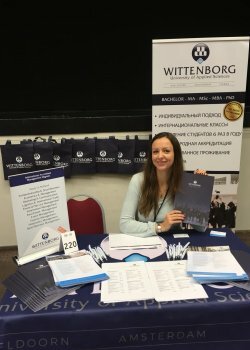 Wittenborg was represented by Iryna Bernatska, Support Officer & Communication Coordinator at Wittenborg Amsterdam. She was assisted by recent top IBA graduate, Tatiana Nesterenko from Belarus, who graduated with honours this summer. As a Dutch institution, Wittenborg formed part of the Study in Holland Pavilion at the fair which is organised by Nuffic Neso Russia. “We are very satisfied with the quality of the fairs and the number of attendees. It has been our experience that many of the targeted students already know what and where they want to study. Neso Russia is also content with the promotion of the fairs and the numbers of participants at each event,” said Jerke Verschoor, Director of Nuffic Neso Russia. 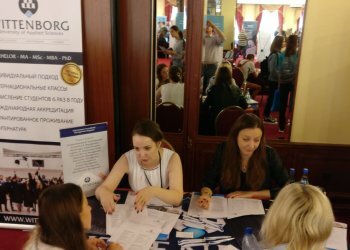 The Begin Grad Tour will happen from 6 – 7 October 2018 in Moscow and St Petersburg. 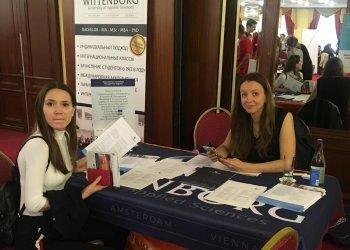 Wittenborg will also be in attendance there to promote its Master of Science and MBA programmes.